Use the browser 'back' button to return to this menu or click 'Top'. 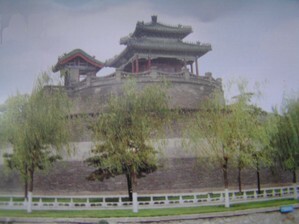 It has a famous history as the capital of one of the Chinese states in the Warring Period, when there was no central authority in China although it doesn't offer as much to travellers as the Imperial cities of Xian, Louyang, Kaifeng, Datong and Beijing. Sadly at the present time, Handan along with many other cities in Northern China does not have very good air quality. Some people are more sensitive to this issue than others. The central area of the city is fairly smart with large tree lined avenues and many decent parks. Tai Chi is definitely part of the life in Handan. Early morning walks are rewarded with high quality Yang Tai Chi being performed all over the place. Each morning on one of Handan's main squares, only a few minutes walk from the Jinan Hotel, large groups of Tai Chi practitioners gather to study with a variety of teachers. 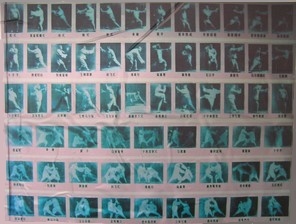 The quality of the Tai Chi is really good. 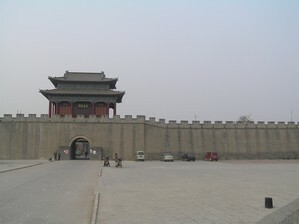 Across the road, is the main park of Handan, with its renovated historic buildings from the Warring Period. The park is great to wander through. Again there are people everywhere doing Tai Chi in the mornings, big groups around teachers, and individuals quietly practicing away. The quality often looked very high, and as people walked past, I'd note their posture and stride and wonder whether they were highly skilled practitioners. 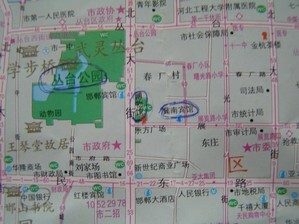 A 7 Yuan taxi ride can get you to any of the other parks - see map and they all seem to be well used in the mornings. In another park, I found a group of women practicing sword forms and they were beautiful to watch. There was also a smaller group on a wooden platform next to a lake, and their Tai Chi was just superb. My first visit to Handan included unexpected and impromptu introductions to Yang Zhi Fang, Yang Chen Fu's Grandson, Xie Yong Guang, one of the Yiquan lineage holders and finally the head of the Yang Ban Hou lineage, luck of the draw. Who knows who you may meet if you make the effort to pass by here! 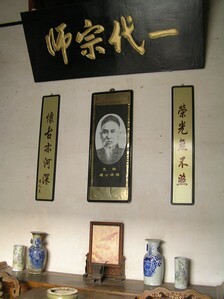 The orignal home of the Yang Family is actually just outside Handan near a walled village called Guangfu, which is an hour's bus ride from Handan. It has the potential to be quite a nice area. They are doing it up at the moment, and it will obviously be a tourist attraction in the future. The old Yang family house was interesting to see although there wasn't any English information available. It's worth a visit anyway. The Tai Chi shop just outside had a good collection of videos for sale, and I asked where some of the practitioners lived. One of the best people teaching Yang Chen Fu Long Form, Han Qing Mi, was apparently very close and they offered to call him for me. I didn't have time free to explore then, but this could be a good opportunity for someone else. Handan is on a major railway line going to Beijing (~3 hours away), so its easy to get there by train from most large cities in China. Some of the faster trains might not stop there though, so it may be quicker to travel to Zhengzhou instead, or Shijiazhuang and then take a local train from there. 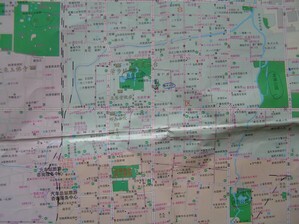 It's about 3hrs by train from Zhengzhou to Handan. 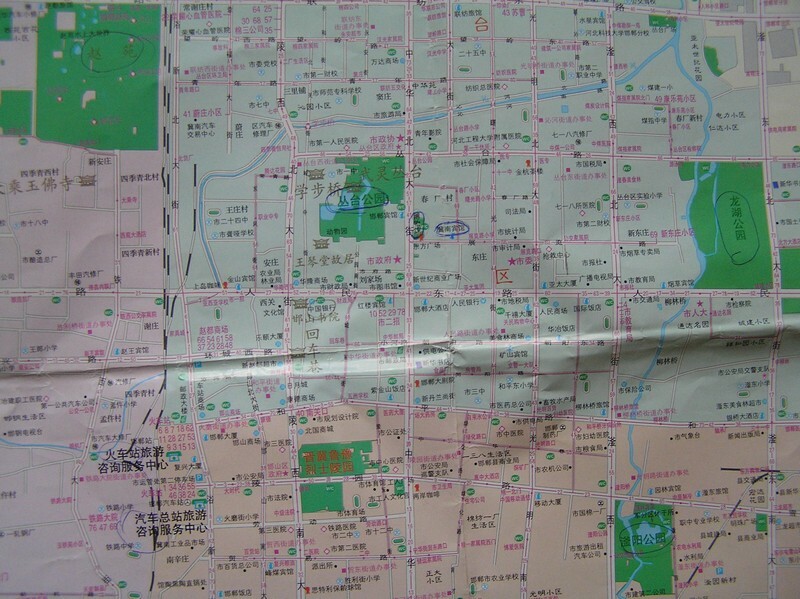 There are also regular buses from Zhengzhou to Handan which take about 4 hours and cost about 70Y. These tend to include a Chinese video on the journey which might not be to most people's taste. Cheap accommodation is hard to find in Handan. The Jinan Hotel, No.2 ZhanLan Road, Tel: 0310 6265888 is good. Rooms are smart and clean. Ignore the advertised rates, they wanted 150Y per night, and I bargained them down to 120Y per night without breakfast. Located right in the centre of the city, the area, although not beautiful, is smart enough and is ideal for making that first contact with the local Tai Chi. Your needs can be met locally in walking distance. Go out of the hotel to the main road, turn left, and left again down an alley next to the Kungfu restaurant, and you'll find a great area of food stalls, with noodles, and fried egg in hot bread etc. great for breakfast. Go past Kungfu and there's a Kentucky Fried Chicken if you can eat that stuff, and there's a posh Pizza Hut restaurant around the corner. There are other restaurants in the area, but it was under redevelopment on my last visit, so I'm not sure what it will look like now. 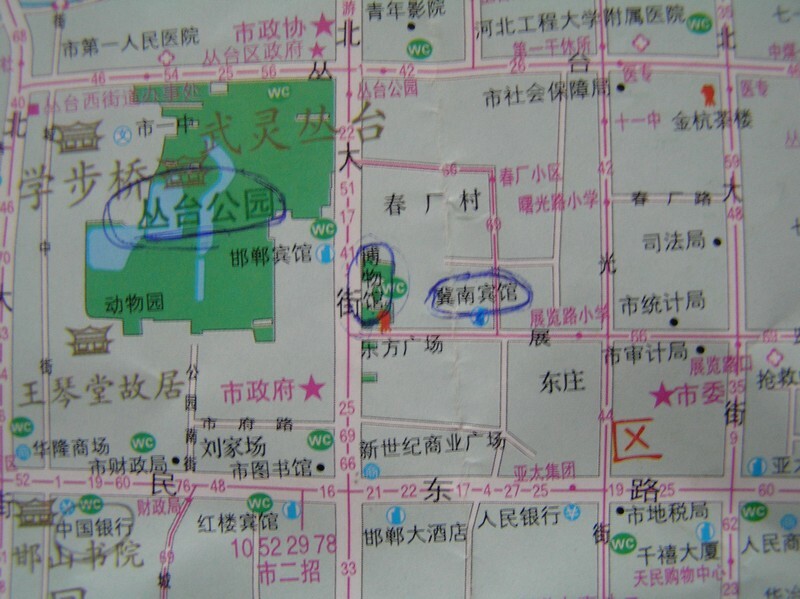 If you need to change money, go out of the hotel, turn left to the main cross roads, and then turn right and walk for 10 minutes you until you come to a huge Bank of China on the left hand side of the road. You can also take a taxi for 7 Yuan. The staff were really friendly and willing to help. They change travellers cheques and the ATM's worked really well paying out up to 2500Y a time. Not much English seems to be spoken in Handan, but I did meet a couple of people. One an English teacher - see below, and the other the Wushu teacher at Handan University. It does help to speak some Chinese in Handan, but you should be able to get by with a little help. There is an English school in the building above the Pizza Hut, and if you need help, the head of the school, Dong Wan Li is willing to meet you and translate etc. His office phone is 0310 2035826. He studied English in Beijing and is really good. His school runs mainly at weekends,sometimes in the evening, so a way of repaying him is to help out with a class or two if you happen to be around at the weekend. If you wanted to stay longer I imagine you could probably arrange a small job there. Climate and When to Go. Like Chen Jia Gou, the climate is quite extreme. Winter is fairly cold, averaging about zero or just below in January and February. Spring is probably a good time to come. Early Summer, May and June are probably quite dry and dusty like the rest of Northern China. July onwards gets quite hot, averaging 28 deg. and if it like Chen Jia Gou (4hours away), this is when they get the most rain, so it is a humid time. So when to go, is a personal choice. The China Taichi Guide : An Introduction to Handan. 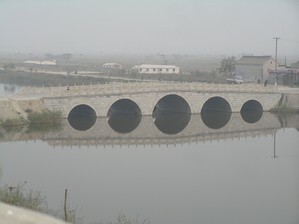 Guangfu, Handan is the home town of the Yang family and Yang Style Tai Chi. There are many good Yang Style Tai Chi Teachers there to learn with. The China Tai Chi Guide is a directory of Tai Chi Schools and Teachers in China.